Revenue grew 15.1% (or 17.8% in constant currency). Growth in Recorded Music digital, physical and artist services and expanded-rights revenue and growth in Music Publishing digital, performance and synchronization revenue were partially offset by a decline in Recorded Music licensing revenue and Music Publishing mechanical revenue. Revenue included a net 6 percentage point benefit from M&A, primarily related to the acquisition of EMP and a 2 percentage point benefit from the adoption of FASB’s new revenue recognition standard, ASC 606. Revenue grew in all regions. Digital revenue grew 17.6% (or 19.9% in constant currency), and represented 52.1% of total revenue, compared to 51.0% in the prior-year quarter. Operating income was $147 million compared to $90 million in the prior-year quarter. OIBDA was $215 million, up 38.7% from $155 million in the prior-year quarter and OIBDA margin increased 3.1 percentage points to 17.9% from 14.8% in the prior-year quarter. OIBDA included a net $8 million benefit from M&A and an $18 million benefit from the adoption of ASC 606. The increase in operating income, OIBDA and OIBDA margin was also the result of revenue growth and revenue mix. Adjusted OIBDA rose 33.3% to $224 million and Adjusted OIBDA margin increased 2.5 percentage points to 18.6% from 16.1% due to the same factors which impacted OIBDA and OIBDA margin. Net income was $86 million compared to $5 million in the prior-year quarter and Adjusted net income was $95 million compared to $18 million in the prior-year quarter. The improvement was due to higher operating income and higher other income associated with the Company’s Euro-denominated debt due primarily to changes in exchange rates and an unrealized gain on investment. Adjusted operating income, Adjusted OIBDA and Adjusted net income exclude restructuring and related costs and certain costs related to the Company’s Los Angeles office consolidation in the quarter, and certain costs related to the relocation of the Company’s U.S. shared service center to Nashville, Los Angeles office consolidation, restructuring and costs associated with management changes in the prior-year quarter. See below for calculations and reconciliations of OIBDA, Adjusted operating income, Adjusted OIBDA and Adjusted net income. As of December 31, 2018, the Company reported a cash balance of $548 million, total debt of $2.998 billion and net debt (defined as total long-term debt, net of deferred financing costs, minus cash) of $2.450 billion. Cash provided by operating activities was $92 million compared to $136 million in the prior-year quarter. The change was largely a result of timing of working capital and the payment of royalties to artists related to the Company’s Spotify share sale in the third quarter of the prior fiscal year. Free Cash Flow, defined below, was negative $146 million compared to $130 million in the prior-year quarter, reflecting higher cash paid for investments related to the acquisition of EMP and higher capital expenditures related to the Company’s Los Angeles office consolidation. Recorded Music revenue grew $137 million or 15.2% (or 17.8% in constant currency). This includes a $76 million increase related to the acquisition of EMP, partially offset by an $18 million decrease related to concert promotion divestitures and a $6 million decrease due to the adoption of ASC 606. Growth in digital, physical and artist services and expanded-rights revenue was partially offset by a decline in licensing revenue. Digital growth reflects a continuing shift to streaming. The increase in physical revenue reflects a strong release schedule. The increase in artist services and expanded-rights revenue was largely attributable to the acquisition of EMP and higher merchandising revenue in the U.S., which was partially offset by timing of tours, concert promotion divestitures and changes in exchange rates. The decline in licensing revenue was primarily due to a $10 million decrease from the adoption of ASC 606 and the impact of changes in exchange rates. Recorded Music revenue grew in all regions. Major sellers included Johnny Hallyday, Ed Sheeran, The Greatest Showman soundtrack, Michael Bublé and KOBUKURO. 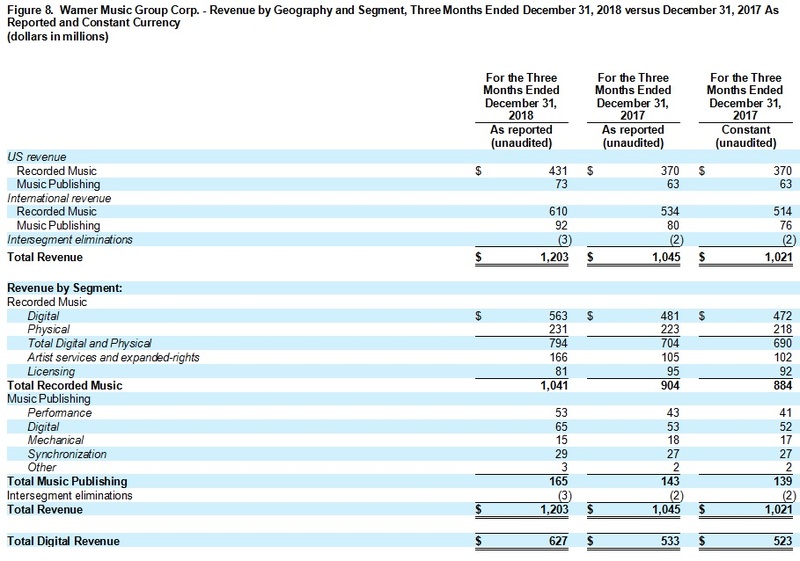 Recorded Music operating income was $163 million, up 26.4% from $129 million in the prior-year quarter and operating margin was up 1.4 percentage points to 15.7% versus 14.3% in the prior-year quarter. OIBDA increased 22.0% to $211 million from $173 million in the prior-year quarter and OIBDA margin increased 1.1 percentage points to 20.2%. Adjusted OIBDA was $215 million versus $183 million in the prior-year quarter with Adjusted OIBDA margin up 0.5 percentage points to 20.7%. Operating income, OIBDA and Adjusted OIBDA includes a net $8 million increase related to M&A, which was partially offset by a $6 million decrease due to the adoption of ASC 606. The increase in operating income, OIBDA and Adjusted OIBDA was also driven by revenue growth and revenue mix. 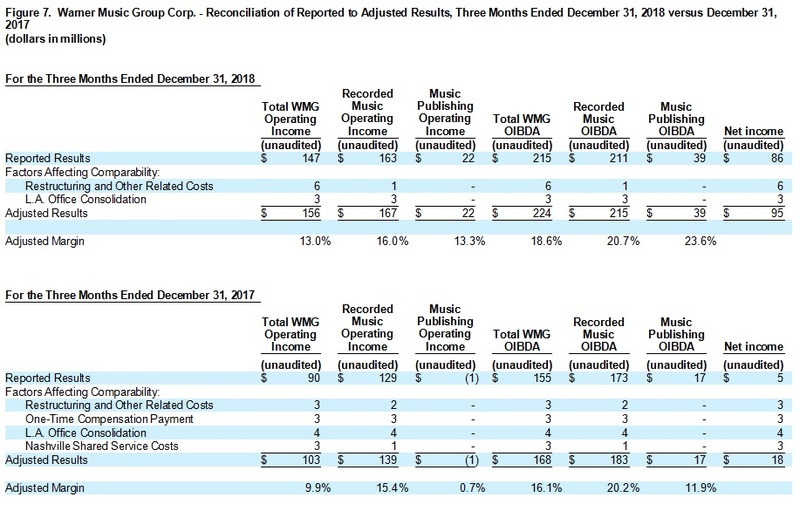 Music Publishing revenue rose $22 million, or 15.4% (18.7% in constant currency) due to the adoption of ASC 606, which resulted in a $26 million benefit. Revenue grew in digital, performance and synchronization, but declined in the mechanical segment, which only relates to physical sales due to the ongoing shift to streaming. Performance revenue grew due to the adoption of ASC 606, but was negatively impacted by lower market share and loss of administration rights in certain catalogs. 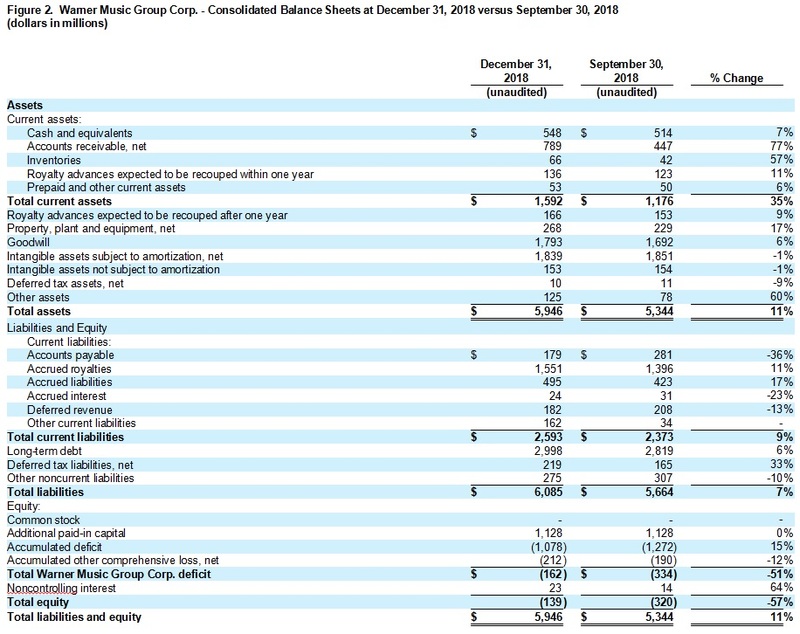 Music Publishing operating income was $22 million compared with a net operating loss of $1 million in the prior-year quarter. Operating margin improved to 13.3% from negative 0.7%. Music Publishing OIBDA increased by $22 million to $39 million and OIBDA margin improved to 23.6% from 11.9%. The increase in operating income and OIBDA was largely due to the adoption of ASC 606, which resulted in a $24 million benefit. Adjusting for the adoption of ASC 606, Music Publishing OIBDA declined due to revenue mix. Financial details for the quarter can be found in the Company’s current Form 10-Q, for the period ended December 31, 2018, filed today with the Securities and Exchange Commission. With its broad roster of new stars and legendary artists, Warner Music Group is home to a collection of the best-known record labels in the music industry, including Asylum, Atlantic, Big Beat, Canvasback, East West, Elektra, Erato, FFRR, Fueled by Ramen, Nonesuch, Parlophone, Reprise, Rhino, Roadrunner, Sire, Spinnin’, Warner Bros., Warner Classics and Warner Music Nashville, as well as Warner/Chappell Music, one of the world's leading music publishers with a catalogue of more than one million copyrights worldwide. The Company maintains a 52-53 week fiscal year ending on the last Friday in each reporting period. As such, all references to December 31, 2018 and December 31, 2017 relate to the periods ended December 28, 2018 and December 29, 2017, respectively. For convenience purposes, the Company continues to date its financial statements as of December 31. The fiscal year ended September 30, 2018 ended on September 28, 2018. Adjusted operating income (loss), Adjusted OIBDA and Adjusted net income (loss) is operating income (loss), OIBDA and net income (loss), respectively, adjusted to exclude the impact of certain items that affect comparability. Factors affecting period-to-period comparability of the unadjusted measures in the quarter included the items listed in Figure 7 below. We use Adjusted operating income (loss), Adjusted OIBDA and Adjusted net income (loss) to evaluate our actual operating performance. We believe that the adjusted results provide relevant and useful information for investors because they clarify our actual operating performance, make it easier to compare our results with those of other companies in our industry and allow investors to review performance in the same way as our management. Since these are not measures of performance calculated in accordance with U.S. GAAP, they should not be considered in isolation of, or as a substitute for, operating income (loss), OIBDA and net income (loss) attributable to Warner Music Group Corp. as indicators of operating performance, and they may not be comparable to similarly titled measures employed by other companies.